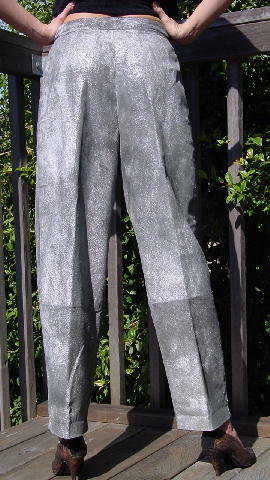 These vintage glittery gray Krizia pants are made of 100% pigskin and the 3/4 length gray lining is 100% rayon. It zips, has one snap in the front, and has 2 front slant pockets. There are no belt loops. There is an area on the left lower leg, front and back, which is not as smooth or glittery. Because of the way the pants glisten, we only noticed this when the pant legs were laid flat and were being closely inspected. The tag says (French) size 44. These pants were made in Italy and are very unique. You'll catch and keep everyone's eye. 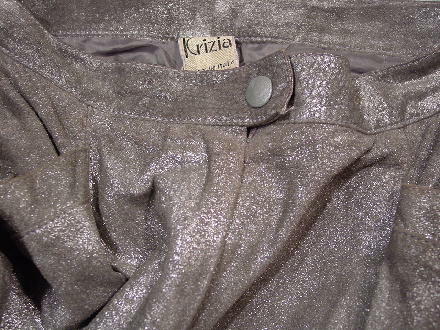 Krizia is not the designer's name - it's the name Mariuccia Mandelli chose for her line in the early 1950s. Her philosophy is that "every woman should dress as she pleases as long as what she wears becomes part of her." 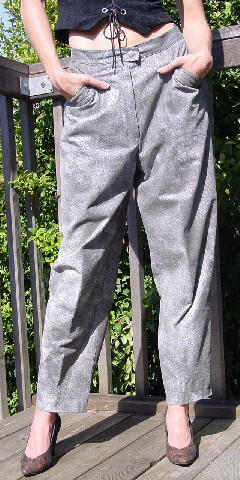 These pants were used for a Vogue shoot (We're not sure in which country in Europe).